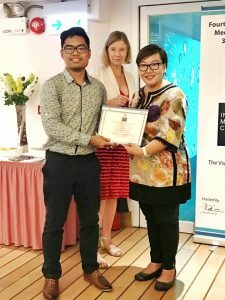 HONG KONG – The De La Salle University College of Law (DLSU COL) bagged one of the top awards from the recently concluded 4th Youth International Mediation Competition (YIMC) organized by the prestigious Vis East Moot Foundation Ltd. held in Hong Kong. Senior year law student Reanne Nichole Lelius Apostol received the Toscar Award, which recognizes the best mediation client during the competition. The DLSU COL delegation was composed of sophomore student Vin Ching, who took part as mediator, and senior student Fidea Encarnacion, who worked alongside Apostol as counsel. Last year’s Colin J. Wall Award for Best Mediator Awardee, Romeo Lanzarrote, served as the team’s coach. The YIMC is a competition organized by Vis East Moot Foundation Ltd. Delegates are made to take part in a 2-day training program before commencing with the competition proper. It is an international arbitration mooting competition, which is attended by more than 120 teams from all over the world.